We know this is not strange to most of us but to some of us its an agony to remember, so many ‘Azaa’ people have hit upper west the past years and their games have kept a long lasting scar in our hearts we’ll never forget so easily. The investment bank that landed in 2013 was able to sway almost 480 people in Wa Municipality into their trap called investment, people had hopes to make ‘cheap’ millions and as the saying goes ‘cheap things are expensive’. Emakpa had so many extra businesses including Guest houses and was able to run away with monies valued at millions of cedis from desperate upper Westerners. The owner of Emakpa is alleged to be from Tamale in the Northern Region. 2. Diamond Winners : This was also an investment hub where people rushed to, some even to an extent of taking loans to grab cheap profits low and behold they got swayed and a notice of disappointment was pasted on their glass door. We couldn’t believe it and our hearts got broken for the second time, you can imagine Emakpa and Diamond Winners Combined, the headache was unbearable and the workers were uncomfortable, rich but the source of their money, we couldn’t comprehend. Diamond winners equally had various businesses including Mini buses like Sprinters travelling to Kumasi and Back to Wa. 3. DKM: The only Micro Finance company that shocked three innocent Regions to Death was Mr. Delle Martin’s Finance Company. People died through this scandal but I don’t blame them for greed they say is paid with bitterness. What I couldn’t understand was why he had no branches in Tamale. Dkm was offering 100℅ in 3months and people as usual rushed for that golden opportunity forgeting the usual saying ‘ not all that glitters is gold’ he promised to work on Nandom roads but all to no avail. People were convinced he was sabotaged by Dr. Papa Kwesi Nduom and his group because people were withdrawing their monies from his banks. Through this a fake Bank of Ghana notice was pasted at his upper west office. The day DKM was closed was the day people fainted but his failure was the success of others. As I speak to you some liquidators like George M. Puoppelle an over the counter medicine seller in Kambali has secured himself a car valued at Ghc80,000 from such liquidations all thanks to DKM. All in all so many people have lost their lives and loans.All in the name of DKM. 4. Little Drops: another company that promised heaven but brought hell will never be forgotten so soon. Promises like save 500 cedis for 6months and earn ghc5000 was so mouthwatering that people fell for the traps again. As the saying goes, lack of knowledge my people perish. This company also collapsed and money was stolen away. This company came after the top listed options had slaughtered majority. The scandal was packaged in a different box again for the same people and they fell for it. 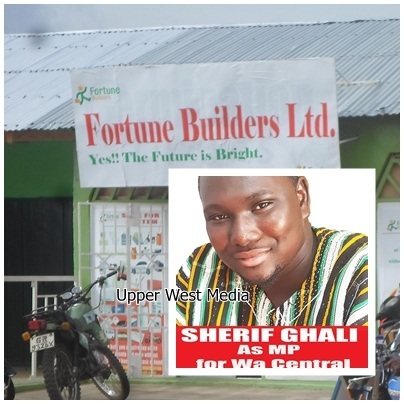 People were promised heaven again, commissions, percentages and subsidies on purchases and guess what happened, the company collapsed in 2015 and CEO for it, Mr. Sheriff Ghali was left with no option but to leave the town, he was accused of using investments for sponsoring his political campaigns as then parliamentary candidate on the ticket of PNC. Worse things happened in this case as people took loans out of desperate desire to get it cheap and guess what happened, after microfinance companies frustrated them, mallams confused them and cleared them thereby reducing them to nothing. They ask you go bring money for more money just like those microfinance companies and when you bring it, they give you monies that disappear afterwards. This frustrated people in upper west and made times hard in the region Till date. There is another one and because people easily forget they are falling for it. It is called Touchlife and people are joining through WhatsApp groups, how blind we are, you don’t know them, their head office nothing about them yet you’ve just Invested your money again and even inviting others to another trap. keep being that ignoramus and you’ll keep being deceived. August 12, 2018 in Business.